I'm attempting to make a NES/6502 emulator in JS. Awesome project! Last year, I wrote a NES emulator in C and it was one of the most rewarding things I've worked on. For testing, I highly recommend running instr_test-v4. It has tests for all the opcodes (there is even one that tests the illegal/unofficial opcodes) and prints a report to both the PPU and to $6000 which is extremely helpful for testing before you have the PPU written. Note: mapper 1 is required for the all/official NES files, but anything in the rom_singles can be run without a mapper. Keep posting your updates here. I'd like to see how your JS emulator progresses. So I've made a bit of progress. 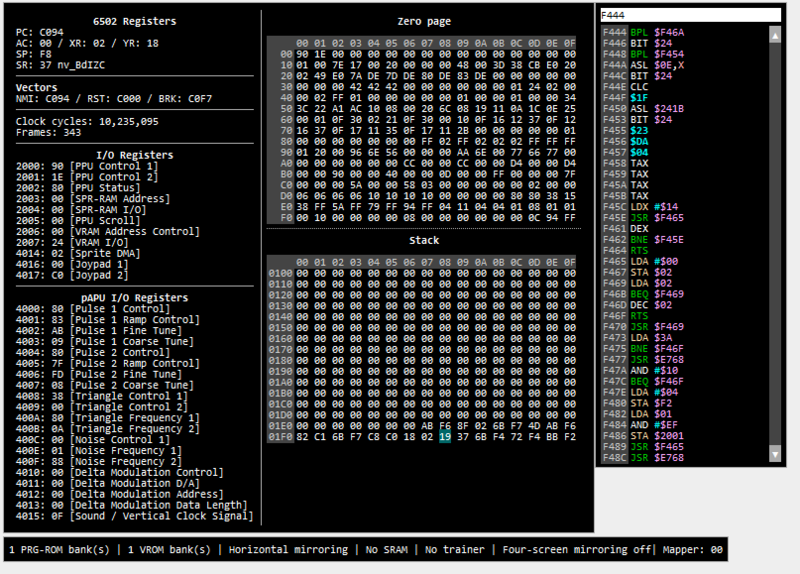 It now loads roms into cpu/ppu memory (quite lazily at the moment). 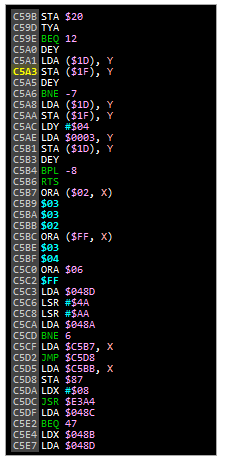 I also added a bunch of stuff to my debugging interface and the 6502 is almost done; just gotta add a few more ops and tweak the ones I got lazy on. I have yet to start on mappers and the other processors. Wow, you're making quick progress! I really like the debugger you've put together. The vector table is at 0xFFFA. You've got the reset one down, but still need to keep track of NMI and BRK. The NMI is the non-maskable interrupt which the PPU will generate on VBLANK once it's turned on and BRK instructions will go to the BRK vector. If you'd like, I can review all the instructions when you think you have them all implemented. I would also recommend against using SMB1 ROM for testing since it is actually one of the more difficult games to emulate. It has made the list of Tricky-to-emulate games. I would suggest starting with one of the NROM games that doesn't use Sprite 0 hit and minimal scrolling such as Balloon Fight or Golf. Note that these are 16K PRG-ROM (only 1 bank) and thus will need to be loaded at both 0x8000 and 0xC000 (usually only the latter is needed) to get the vector table at the end. 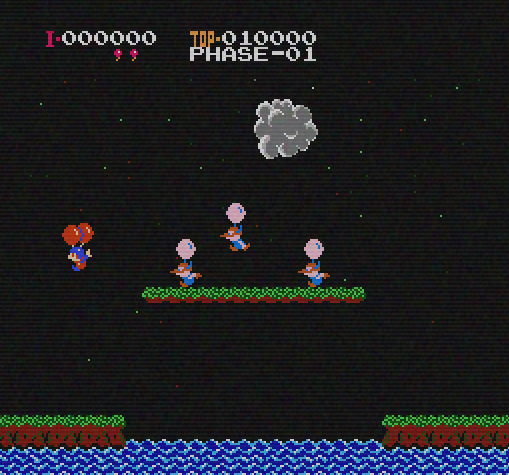 (16-04-2015, 12:46 AM)queueRAM Wrote: I would also recommend against using SMB1 ROM for testing since it is actually one of the more difficult games to emulate. It has made the list of Tricky-to-emulate games. I would suggest starting with one of the NROM games that doesn't use Sprite 0 hit and minimal scrolling such as Balloon Fight or Golf. Note that these are 16K PRG-ROM (only 1 bank) and thus will need to be loaded at both 0x8000 and 0xC000 (usually only the latter is needed) to get the vector table at the end. I would agree to this to an extant. I think it's a good idea to try running a ROM like Super Mario Bros. because if the emulator he's making can work perfectly with games like Super Mario Bros, Zelda, etc. it would be easier to run everything else. 6502 emulation is running accurately now and is practically done besides for a few register r/w events (thanks again queueRAM for a ton of help debugging), and I'm just getting started on the ppu. Also note that the file has been moved here http://file.s.gp/NES.php so I can have a build date/signature at the top automatically. Color updates aren't completely optimized yet so slow-downs are to be expected with games that use color-changing sprites. I'm thinking TAS and memory scanning features would be relatively easy to add so that will definitely be something for the future. I'm also thinking multiplayer support over http might be possible using some sort of ajax & byte serving setup with some game-specific ram synchronization rules but I'm a bit doubtful that it'll be fast enough to work properly. WebSocket setup and I'll probably give it a shot at some point.